Ink recycling is not new. It’s been around for years now and many people take advantage of it regularly. The best part about it is that there’s no real risk of shutdowns, but that’s likely due to the profit for recycling being much lower than many manufactured spending techniques. Anyway, if you’re interested in earning an extra $40+ per month, hit the break to learn more. There are 4 main ink recycling programs: Staples, Quill, OfficeMax, and Office Depot. However, come January 2015, OfficeMax and Office Depot will be rolling out a merged rewards program called Office Depot | OfficeMax Rewards. Real original guys… So, for the sake of this post, I will include that rewards program in the comparison below. Staples is by far the most generous recycler. They offer $2 per cartridge (up to 20 per month for Plus and Premier members), free online recycling, and they only require a $30 purchase of ink/toner every 6 months. Quill is owned by Staples, but they both have separate recycling programs. Quill’s program is not near as generous as Staples, in fact I would say it’s the worst of all the programs. Instead of giving you straight up store credit for your ink they give you what they call “QuillCash”. That sounds like store credit doesn’t it? Well, it is and isn’t sort of. Quill allows you to recycle up to 10 cartridges per month for $2 each. That means you can earn a maximum of $20 worth of QuillCash per month by recycling. QuillCash can then be redeemed on any purchase over $100. So, that makes your $20 worth of QuillCash basically a $20 off $100 coupon. Couldn’t you just save the QuillCash until you had over $100? I’m glad you asked, but the answer is no. You have 90 days from the time of issuance to use your QuillCash, so the maximum coupon, err I’m sorry, maximum amount of QuillCash from recycling you can use on one purchase is $60. That’s pretty crappy if you ask me. OfficeMax and Office Depot offer programs that are very similar to each other. They both allow you recycle up to 10 cartridges per month at $2 each. The difference is that the rewards you earn from recycling at OfficeMax must be spent on product throughout the month you earn the rewards. 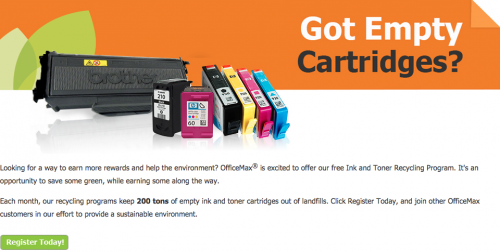 It’s a little confusing, but basically if you recycle the full 10 cartridges and spend $20 at OfficeMax that month, you will earn the $20 back in rewards. If you spend only $15, you will only get $15 back in rewards. It’s a weird system. Like I said, the OfficeMax and Office Depot system are very similar. 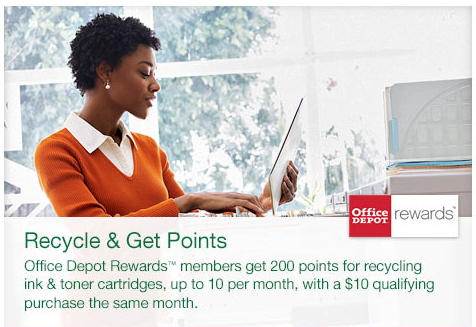 The difference is Office Depot rewards can only be earned from recycling, when you make $10 in qualifying purchases throughout the month. OfficeMax and Office Depot have merged, which means they are rolling out a new rewards program in 2015. This is bad news for recyclers, because their new ink recycling program will be less profitable than the current ones. The new system works just like Office Depot’s current system, in allowing only 10 cartridges per month. So, come January 2015 only half of the possible 20 cartridges you would have recycled via OfficeMax and Office Depot can be recycled. Other Info Can recycle online Can recycle online Can only use on purchases over $100 Many purchase restrictions including tablets and computers. Many purchase restrictions including tablets and computers. Many purchase restrictions including tablets and computers. Recycling ink cartridges is great when you have ink to recycle, so where do you get them? You could use 50 ink cartridges per month, but that would be super expensive and it would kinda defeat the purpose of recycling. The trick is to buy them on eBay. You can commonly find ink cartridges on eBay for anywhere from $0.10 – $0.20 each. Considering that you can recycle them for $2 each, you will quickly get your money out of that purchase. I purchase them in as large of quantities as I can find, because they usually have the lowest cost per cartridge. 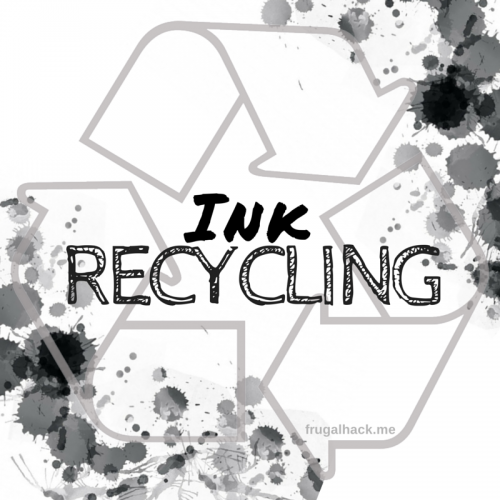 Ink recycling is an easy way to increase your cash input without much work. If you regularly visit any of the office stores above, I would highly suggest recycling your monthly allowance of ink.